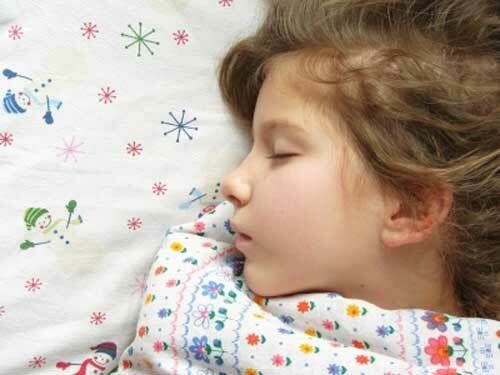 Sleep apnea in children is fairly common. Although it is more common in adult men than in women and children, it is not unusual to see the condition in either of the two. Childhood sleep apnea may be caused by obstruction of the air passageway, such as would be caused by enlarged tonsils. It can occur as a result of upper respiratory infection, in which case, resolution of the infection resolves the breathing problem. Apneas, whether in adults or children, should be diagnosed before treatment is considered. A "sleep study" can be conducted, in which the person’s breathing is monitored in a clinical setting throughout the night. There are also tests that can be conducted in the home. Almost all cases of sleep apnea in children and adults are accompanied by snoring. But, snoring is not always indicative of apneas. Some people snore without having interrupted breathing. The diagnosis is made when breathing stops repeatedly throughout the night. One or two breaths appear to be missed. When breathing begins again, the person typically gasps for air. Childhood sleep apnea that is not caused by obstruction can be caused by another medical condition or by an imbalance in the brain’s respiratory control centers. Premature infants have an increased risk of apneas, but with proper care, the condition corrects itself as they mature. Childhood sleep apnea is sometimes blamed for sudden infant death syndrome, although the connection has not yet been clearly defined. Doctors typically recommend having the infant sleep on his or her side, rather than on the back or stomach. If the cause is an obstruction in the air passages, sleeping on the stomach could close the passageway. A diagnosis of "central" sleep apnea in children means that the problem is in the brain, rather than an obstruction in the air passages. In adults, the obstructive type is most common, although there are a few cases of complex apneas, in which both obstructive and central problems are present. The cause in adults is commonly a loss of firmness in the muscles of the larynx. They collapse, instead of remaining firm. Alcohol abuse, smoking and obesity are common risk factors. The only one of the three that could be a problem in childhood sleep apnea is obesity. Unless the cause is an obstruction that needs to be surgically removed, the most common treatment for sleep apnea in children and adults is a CPAP or continuous positive airway pressure device. The air pressure keeps the breathing passages open and a good night’s sleep is restored. A recent study has shown that sleep apnea masks used with CPAP machines are effective at alleviating the symptoms of sleep apnea. Dr Jong-Won Kim who, along with colleagues from the University of Sydney, conducted the study said, "Sleep apnea in children may be related to death and loss of brain cells that lead to underdevelopment. So it is vital that medical doctors definitely know that their prescribed method will provide a sound sleep for their patients," Dr Kim added, "By wearing the mask people can sleep comfortably and without fear of choking in their sleep." Childhood sleep apnea is common and parents should always consult with their child's doctor if they suspect sleep apnea is affecting their child's ability to get the restful sleep they need to develop and remain healthy.